Merry Christmas 2017 & Happy Holidays! Don’t forget the Tic Tac Trance Yearmix 2017 is still available as Stream & Download! Tic Tac Trance #120: Yearmix 2017 Replay available! 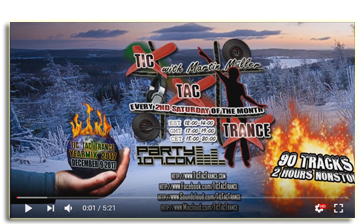 90 Tunes, over 1300 Edits, and too many hours of work, this year’s final episode #120 of Tic Tac Trance will air on December 9 2017 @Party107.com! Together with you I’ll celebrate my favorite progressive & techy, but also uplifting & psychedelic underground trance tunes of this year in a 2 hours nonstop mix. You can expect a crazy mashup festival with my highlights of this year’s trance selection. Are you interested to see HOW the mix was actual done? You can check out the Tic Tac Trance #120: Yearmix 2017 Time Lapse Teaser Video on Youtube.com/TicTacTrance! 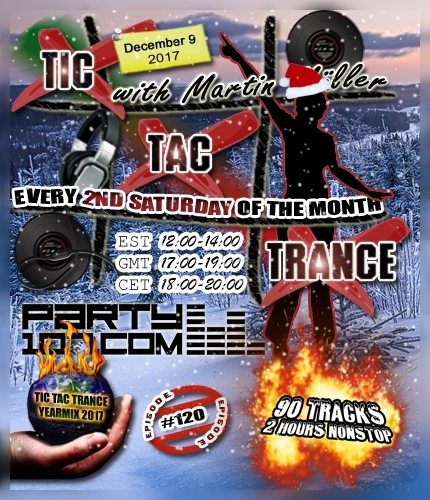 On December 9 2017 the last episode of Tic Tac Trance for this year will air on Party107.com. Episode #120 will feature the Yearmix 2017 and includes 90 of the best trance tunes, which were aired in the radioshow Tic Tac Trance during the year 2017.